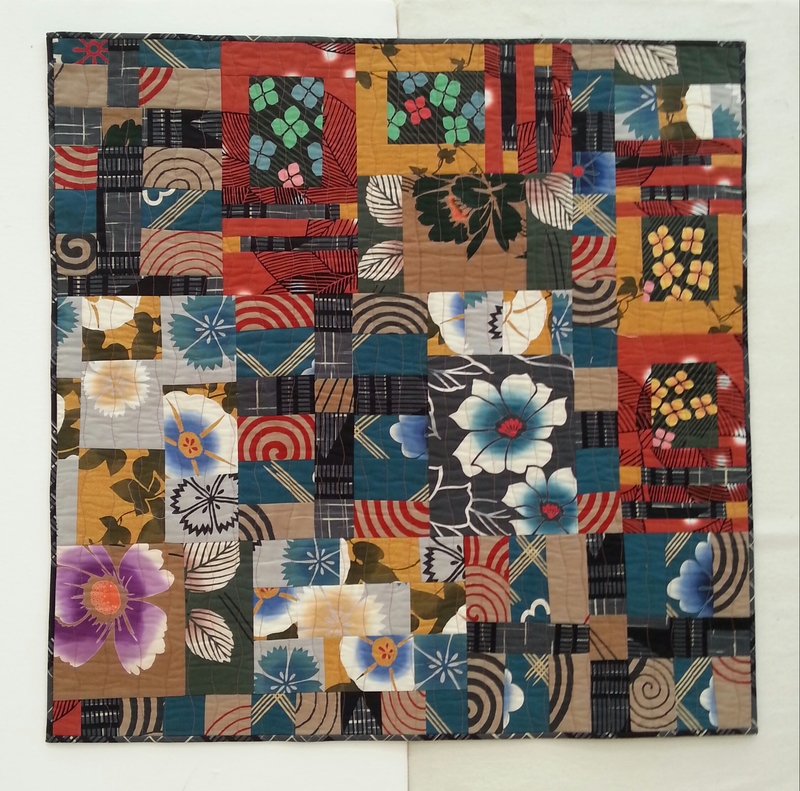 Yesterday I took a workshop entitled “Counter-intuitive Quilting” sponsored by Kitsap Quilters Guild and taught by Patricia Belyea who lectured at the guild last week and share her wonderful Japanese yukata cottons (see earlier blog posting). 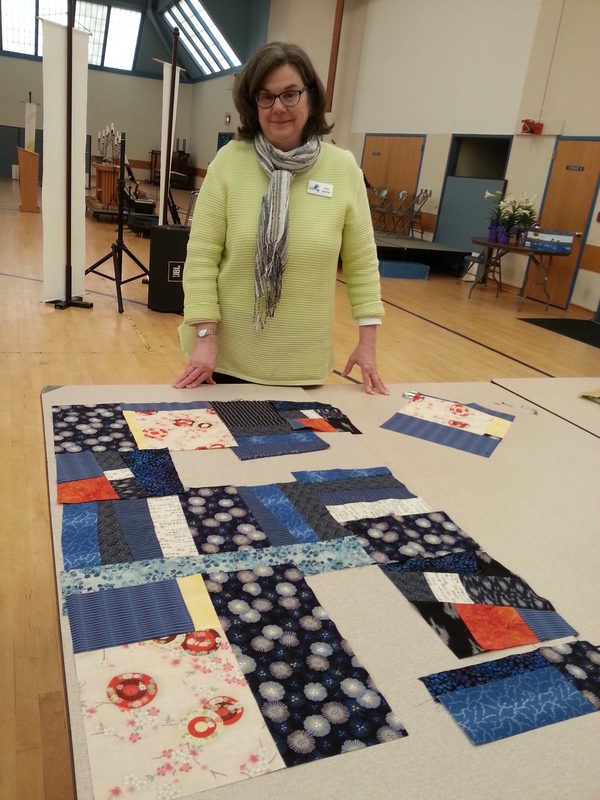 These photos show Patricia’s cheerful quilt (overall and a detailed shot), Wabi Sabi, which translated from Japanese means love of imperfection. 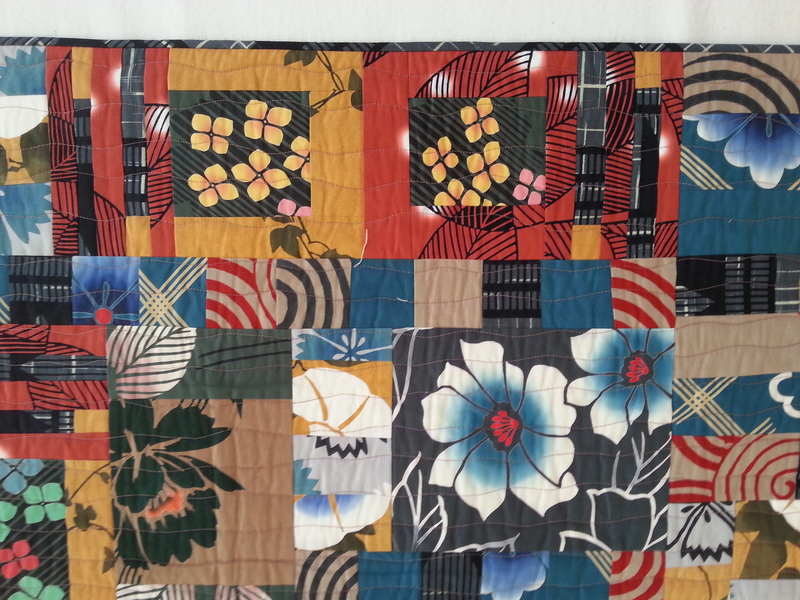 If you look closely at the quilt, you can see some repeated elements. The basic technique involves choosing fabrics to work with and then designing three very simple blocks which are pieced together in a free-form way (we made three of each). When the blocks are put together, pieces are added to fill in any spaces, for example, some of the large flowers. 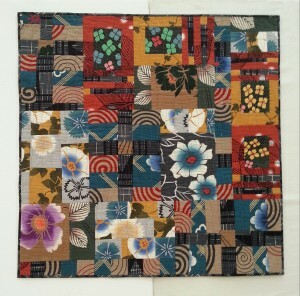 The blocks may trimmed or divided into smaller sections if they don’t fit and the pieces that were cut off may be moved to another area of the quilt top. Here is Patricia examining my work. For me, the whole thing seemed too chaotic when I put all my blocks adjacent. I liked them better when I separated them and put some space around them. This reflects my tendency to want my quilts to look more organized and symmetrical. 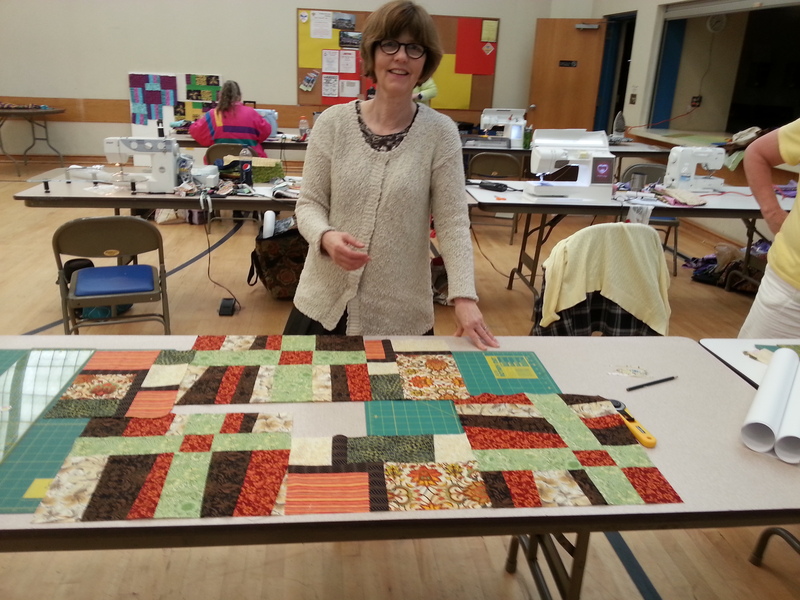 It was quite a stretch for me to cut the fabric with scissors to the approximate shape needed and to piece them together without much regard for straight seams – in fact creating wonky blocks was encouraged. The first set of blocks I made, I used my rotary cutter and had very straight seams, than I took the plunge and used my scissors to make some that were much more irregular. The class was inspiring and I enjoyed trying a different approach. Usually I design a pattern, and then choose fabrics for it, although my initial inspiration may come from a particular fabric that I like. 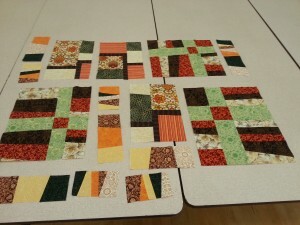 In this case we chose the fabrics we wanted to work with and more or less designed the blocks as we went along. Elizabeth Mador made some interesting blocks using purple and chartreuse fabric and a burgundy that had embroidered spirals. 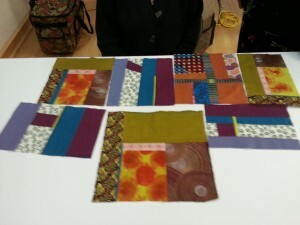 Lisa Jowise had some beautiful oriental fabrics for her blocks. We had a very enjoyable day. This entry was posted in Inspiration and tagged class, Fabric, inspiration, quilts by Maggie Ball. Bookmark the permalink.